Why not put that song you can’t get out of your head, onto your shirt? Include some of the lyrics and an image of the artist. You can find both online. Maybe movies are your thing and you’d rather use an image of your favorite film scene and memorable dialogue. Perhaps you’d rather have photos of your family. 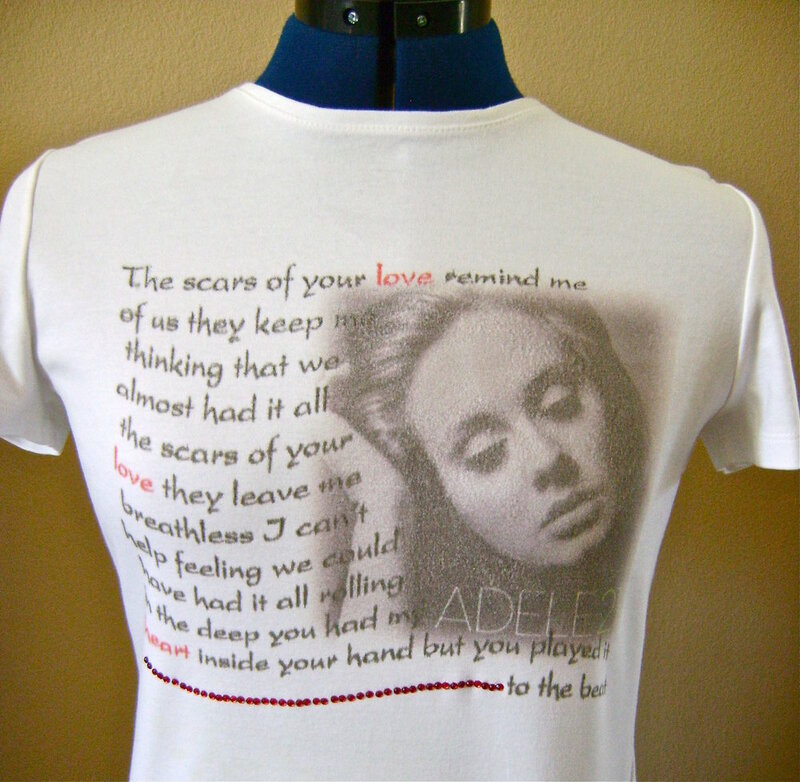 This tutorial will show you how to transfer images and words onto a shirt with your inkjet printer. Find the image and words you want online and save them as a jpeg. Open them in Photoshop elements or a similar program. Type the words to the left of the image manually moving to the next line to avoid covering the image completely. Select the words “love” and “heart” and change them from black to red type. step 1 - The type selections at the top of the Photoshop window should be Snippet Script, 42pt type, and 48pt for line spacing. step 2 - To wave the text, select it with the text tool. Go to the Layer menu and select Type then Warp Text. step 3 - Under Style choose Wave. Move the slider under Bend to +24%. step 4 - Soften the edges of the image by feathering it with 20 or more pixels. step 5 - Save a copy of your document. In the Layers menu click “merge visible”. In the Image menu select “rotate and “flip layer horizontal”. step 6 - Your page is ready to print. step 7 - Draw a line down the center of a 8.5” x 11” page. Spray the opposite side with adhesive. Place the page on the dull side of the Freezer Paper and cut the Freezer Paper to match the same dimensions. step 8 - Feed the page into the inkjet printer so that it prints on the shiny side. step 9 - Mark the center of your shirt with tape above and below the image area. Place flat heavy cardboard or a cutting board inside the shirt. Use a spray water bottle to lightly dampen the shirt’s surface. Too much water will cause the image to smear. Avoid touching the print with your hands. Carefully place the printed page image-side down. Align the center of the page with the center of the shirt. Once the page touches the shirt, it cannot be moved. Hold the page in place on the shirt and go over it with a rolling pin or brayer to be sure all of it has made contact with the fabric. step 10 - Lift the page evenly when finished. After an hour, place a cloth over the image and iron on cotton setting. Optional: Apply a row of red rhinestones following the last full line of lyrics. Expect some fading of the image with washing. The longevity of the shirt design will vary with printers, colors, and washing methods. Do not use fabric softener before applying the image to the shirt. For the best results, cold water, hand washing with mild soap and air drying is recommended. Scotch Guard may prolong the life of the image.